The undercarriage of a machine represents a significant portion of a piece of equipment’s purchase price. Proper maintenance and operation practices are critical for protecting your equipment investment. Undercarriage maintenance is critical to the overall productivity of a machine. It is the mechanism that gives tracked machines much of their power and stability. It also represents a high percentage of the total operating cost of the machine over its life. Proper maintenance and operation play a critical role in controlling operating costs over the life of any piece of equipment. Here are the top 15 maintenance and operating considerations that will help you maintain the health and productivity of your tracked machine. Undercarriage monitoring and upkeep is critical, and there are several basic maintenance practices that owners and operators can engage in to extend undercarriage life. Operators should perform daily inspections of their machine’s undercarriage, looking for excessive or uneven wear and damaged or missing components. Check for proper clearance between the track chain and idler roller. Also, be sure to check the drive sprockets and track pads for damage and wear. These and other wear issues can be indicative of a larger potential problem, or can lead to further damage, and should be addressed immediately. One of the most important things to check regularly is proper track tension, ideally while the machine is in actual working conditions. When steel tracks are too tight, it creates added load on contact areas, which can accelerate component wear. A track that is too tight also robs the machine of its power and fuel efficiency, as it actually takes more effort to turn the track. If a track is too loose, it can create instability and potentially cause the tracks to derail, while also causing wear on other components of the undercarriage. Track tension should be checked daily, with the sag adjusted to the OEM-recommended measurement for each machine. If conditions change throughout the day, it would be wise to check track tension as the machine settles into that new working environment. When working in mud, snow and sandy conditions, the track tension should be checked more often. Material will pack on the undercarriage parts and increase track tension. It is important to keep the undercarriage clean. At the end of a workday, operators should clean out any mud or debris from the undercarriage. This is particularly important in northern climates where material can freeze inside the track during the winter months. Optional covers and guards are available to help keep the undercarriage clear of ice and debris. Correct track alignment is necessary in order to prevent wear of the undercarriage components. Misalignment problems will affect more undercarriage components than any other issue. Track links, idler flanges, track and carrier roller flanges, sprockets and rock guards can all suffer from increased wear when the tracks are not properly aligned. Equipment owners can better tackle undercarriage costs and needs if they know where they are in the life of their undercarriage. We recommend setting a benchmark – based on the type of environment the machine is engaged in – to measure the undercarriage. Measure the bushings and rollers and, if these components have been reduced to 85 percent of their original diameter, rotate them 180 degrees. Gauging this pace of wear over time will give the equipment owner insight into the life expectancy and wear patterns of the undercarriage. Conduct a complete undercarriage inspection in keeping with the manufacturer’s recommendations. More frequent inspections should be performed if the machine is used in conditions that are more demanding than normal. Adhere to routine maintenance guidelines, including oil changes for final drives and checks on undercarriage bolt torques. Proper operation is just as critical as maintenance when it comes to preventing and minimizing undercarriage wear. Here are several operating considerations that can extend the life of your undercarriage components. Proper operating procedures begin before the machine even gets to the jobsite. Check the ground conditions and the terrain—consider the need to minimize travel on the site, as well as the use of steel tracks or rubber tracks, and the narrowest shoe width possible to meet the required flotation. Most importantly, discuss these things with your operators. It should go without saying, but a properly trained and informed operator will follow best practices and make decisions on the jobsite that will minimize wear and tear on the equipment. Always make sure that your operators are properly trained, and have the necessary resources—operating manuals, etc.— made available to them. Knowing which track width is best for the job is an important consideration when it comes to undercarriage health. For firm ground conditions with minimal slope, long tracks are the best fit. With their narrow track gauge and narrow track shoes, they provide high ground pressure and the best traction. When it comes to firm ground conditions with more varied terrain, wide tracks are the preferred track option. Their wide track gauge and wider track shoes provide lateral stability in sloped areas. Low ground pressure tracks are the best suited for soft, swampy ground conditions. The wide track gauge and widest possible track shoes ensure lateral stability and the best flotation. Some manufacturers offer lubricated track designs. As an example, the CASE Max-Life track works best in low impact/highly abrasive ground conditions. Max-Life has a hardened bushing placed over a standard type track bushing, which results in almost twice the wear life of a standard lubricated track design. For larger machines, an Ultra-Life track is available, which is a sealed lubricating bushing for extended life. High speeds can affect the wear rate on pins, bushings and sprockets; the faster the speed, the faster the wear rate. It’s important to note that wear rate is a function of speed and distance traveled, not just hours worked. Operators should also avoid excessive use of reverse operation. It’s not only a non-productive use of the machine, but it also accelerates bushing and sprocket wear unnecessarily. Counter-rotation, or pivot turns, can cause accelerated wear on the undercarriage. Operators should try to make wider, more gradual turns whenever possible. Continuous turning on the same side can cause accelerated asymmetrical wear. Make every effort to balance the direction of turns throughout the day. If that is not possible, be sure to check for wear more often. Unnecessary spinning can increase wear and decrease productivity. This can be avoided by decreasing the blade or bucket load. Another important practice for operators to follow is working up and down on slopes. Constant operation on hills in one direction can accelerate wear to idlers, rollers and guide lugs by placing greater force on one side. Minimizing time spent on the slope will pay off in reduced wear and load to the undercarriage. Try to stay on relatively flat surfaces. Operating the machine with the outside/inside edge of the track turned up can cause damage to the edges and lugs of the rubber track. Avoid traveling with the tracks on uneven ground, or surfaces with obstructions. It’s recommended that excavator operators dig over the front idlers, which properly transfers the vertical load that can otherwise cause damage. Avoid digging over the sprocket because it can cause bushings to crack or break. It’s also important to avoid digging over the sides of the machine given the additional stress it places on track shoes and the track link assembly. At this point in time, most manufacturers offer some type of telematics solution. The critical maintenance and operating data made available through the use of telematics can have a significant impact on undercarriage life, even though no sensors specifically report on undercarriage health. In its most simple form, the reporting hours provided by telematics can be used to accurately keep up on undercarriage maintenance activities, and also create benchmarks for each specific machine and application based on the conditions they are working in. Fleet managers can also dive down deeper and examine the difference between actual working time and idle time to get a better idea of how much load is placed on the undercarriage everyday. Some telematics systems provide details on ground speed, so owners can monitor track speed, which increases wear and decreases the life of the undercarriage. 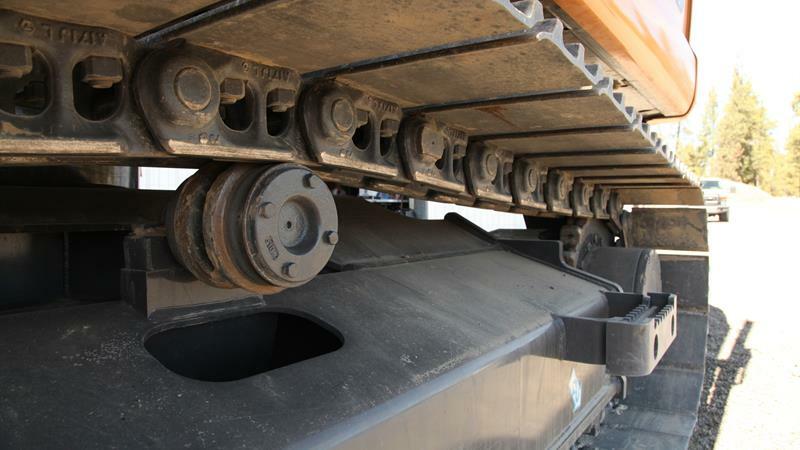 Following these key considerations will optimize the life of the undercarriage of your tracked machine. Remember, your productivity is on the line, so it’s critical to regularly monitor track appearance, wear and performance – and never hesitate to contact your local dealer/equipment service partner with questions or concerns.